Archival images of EPIC 228813918, demonstrating its proper motion over nearly six decades. The images are from (i) 1954, (ii) 1992, and (iii) 2012. Each image is 50 by 50, and in each case North is up and East is to the left. The position of EPIC 228813918 (J2000 epoch) is indicated with a red reticle. The blue reticle in the leftmost panel indicates the position of the star used to determine the limiting magnitude of the image. The arbitrarily-positioned green rectangle in image (ii) indicates the size of the photometric aperture used by Vanderburg & Johnson (2014) to extract the flux of EPIC 228813918. The cyan (NE of target) and magenta (SE of target) reticles in image (ii) indicate the positions of EPIC 228814238 and EPIC 228813721, respectively. Credit: Smith et al., 2017. (Phys.org)—An international team of astronomers has detected a new Earth-sized exoplanet in an ultra-short period around its parent star. The alien world, designated EPIC 228813918 b, circles its host every four hours and 20 minutes, which makes it the second-shortest orbital period of a planet known to date. The finding was presented in a paper published July 14 on arXiv.org. EPIC 228813918 b was identified by a group of researchers led by Alexis Smith of German Aerospace Center's (DLR) Institute of Planetary Research in Berlin, Germany. The transit signal was detected using NASA's prolonged Kepler mission, known as K2, during its Campaign 10, lasting from July 6 to September 20, 2016. The planetary nature of this signal was confirmed by adaptive optics imaging, radial velocity measurements, light curve modeling and analysis of archival images, which excluded the possibility that the star EPIC 228813918 could be an eclipsing binary. For follow-up observations, the researchers used a variety of instruments, including the Infrared Camera and Spectrograph (IRCS) on the 8.2-m Subaru telescope at Mauna Kea, Hawaii, the HIRES instrument of the 10-m Keck I telescope, also on Mauna Kea, the NESSI imager on the 3.5-m WIYN telescope at the Kitt Peak National Observatory, Arizona, and the Andalucia Faint Object Spectrograph and Camera (ALFOSC) mounted at the NOT telescope of Roque de los Muchachos Observatory (La Palma, Spain). "We use its K2 light curve, radial velocities, archival images, adaptive optics imaging and a catalog of eclipsing binaries (EBs) to demonstrate that EPIC 228813918 is a transiting planetary system, and not an EB," the paper reads. The newly found planet is slightly smaller than Earth (0.89 Earth radii). However, it's extremely massive – its estimated maximum mass is 0.7 Jupiter masses. The exoplanet orbits an M-dwarf star nearly half the size and mass of our sun every 4.3 hours. The planetary system is located some 310 light years away from the Earth. The ultra-short orbital period of EPIC 228813918 b makes it the second shortest-orbital-period alien world discovered so far. The record holder is still KOI-1843 b (also orbiting an M-dwarf star), which has an orbital period just four minutes shorter than that of the newly detected planet. The researchers also managed to determine the chemical composition of EPIC 228813918 b. According to them, the planet has an iron core and a silicate mantle. The minimum iron mass fraction was found to be about 0.52, which is greater than that of Earth, Venus or Mars, but smaller than that of Mercury. The authors of the study concluded that the discovery of such extreme planetary systems like EPIC 228813918 is important for improving our knowledge about planet formation processes. "Discovering and characterizing extreme systems, such as ultra-short-period planets like EPIC 228813918, is important, as they offer constraints for planet formation theories. Furthermore, they allow us to begin to constrain their interior structure and potentially that of longer-period planets too, if they are shown to be a single population of objects," the astronomers wrote in the paper. 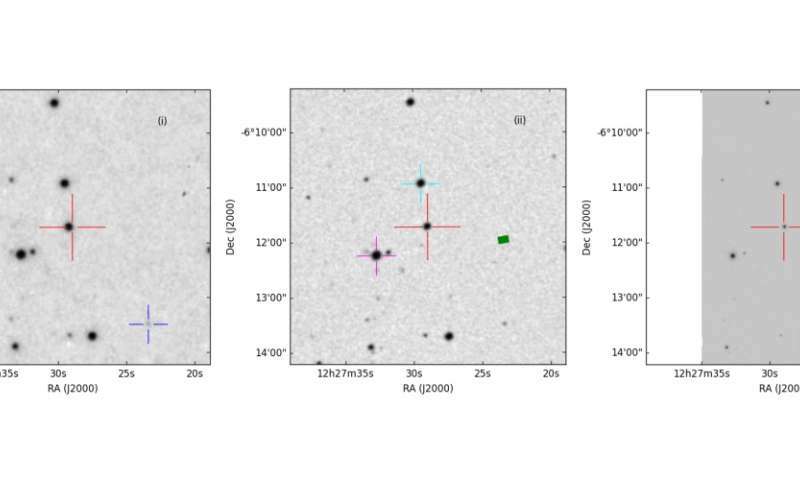 We report the discovery from K2 of a transiting terrestrial planet in an ultra-short-period orbit around an M3-dwarf. EPIC 228813918 b completes an orbit in only 4.3 hours, the second-shortest orbital period of any known planet, just 4 minutes longer than that of KOI 1843.03, which also orbits an M-dwarf. Using a combination of archival images, AO imaging, RV measurements, and light curve modelling, we show that no plausible eclipsing binary scenario can explain the K2 light curve, and thus confirm the planetary nature of the system. The planet, whose radius we determine to be 0.89 +/- 0.09 Earth radii, and which must have a iron mass fraction greater than 0.45, orbits a star of mass 0.463 +/- 0.052 Msol and radius 0.442 +/- 0.044 Rsol. "we consider a very conservative upper-limit to the mass to be 3 (Earth mass)(Seager et al. 2007 predict a mass of around 2.7 (Earth mass) for a 1 (Earth radius) planet composed of solid iron)." So the authors "very conservative upper limit" is actually 3 Earth masses, not 223 Earth masses (0.7 Jupiter mass), and unless is it a ball of iron and heavy metals, it is probably less massive than that. ... which is why they called it earth-sized. Duh. If it circles its host every 4 hours or so it's very close in. The equilibrium temperature they come up with is roughly 1500K. That'll boil the socks off most anything. So the remainder should be quite a bit more dense than Earth average.